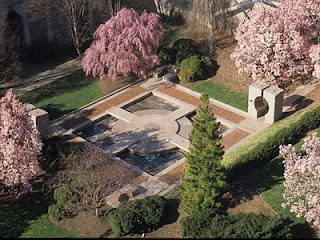 The Smithsonian Gardens were the unique vision of eighth Secretary S. Dillon Ripley (1913-2001) who sought to extend the museum experience beyond the halls of the museum's buildings. 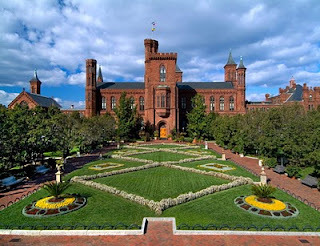 The largest of several gardens, the Enid A. Haupt Garden was constructed in 1987, replacing an existing Victorian Garden built in celebration of America’s Bicentennial in 1976. ﻿﻿The Enid A. Haupt Garden was designed to complement the buildings of the underground Quadrangle complex and is comprised of a Victorian parterre, the Moongate Garden and the Fountain Garden. This Saturday and Sunday (September 25-26, 2010) The Cultural Landscape Foundation is hosting a What's Out There Weekend, providing residents and visitors an opportunity to discover and explore 25 of Washington’s iconic cultural landscapes, including the Smithsonian’s own Enid A Haupt Garden, Mary Livingston Ripley Garden and Hirshhorn Sculpture Garden. What’s Out There Weekend tours of the Smithsonian Gardens are scheduled for 10am and 1pm on September 25 and 26. Further information can be found on The Cultural Landscape Foundation’s website.